All statewide executive and state legislative primary elections are now complete, giving us the opportunity to take stock of women's candidacies and put their successes into context. Note that our findings on primary success and nominations do not include contests that remain too close to call or Lousiana's special election for Secretary of State, which will be held as a jungle primary on November 6th. Women gubernatorial candidates have run for and won nominations in record numbers this year. But women are still underrepresented as a proportion of all gubernatorial nominees, with significant disparities by party. While women shattered the record for gubernatorial nominees this year, there is no guarantee that they will break the record for women governors serving simultaneously – which is 9 - in 2019. Regardless of numbers of winners, the diversity among women gubernatorial candidates is notable this year. In addition to 3 (3D) LGBTQ nominees (Kate Brown-OR, Lupe Valdez-TX, and Christine Hallquist-VT), there is more racial and ethnic diversity in this year’s pool of women gubernatorial candidates than ever before. 5 of 16 women nominees are women of color, including 4 Democratic nominees who would be the first Democratic women of color ever elected governor in the U.S.
Stacey Abrams (D-GA) would also be the first Black woman governor in the U.S. With her counterparts this year. She is also the first Black woman nominee for governor in the country. Michelle Lujan Grisham (D-NM) and Lupe Valdez (D-TX) would be first Democratic Latinas elected governor in the U.S.
Paulette Jordan (D-ID) is the first Native American woman nominee for governor nationwide. She would also be the first Native American woman governor, and just the second Native American woman elected to a statewide executive office in the U.S.
Andria Tupola (R) is the only Republican woman of color nominee and the only Asian/Pacific Islander woman on a general election gubernatorial ballot in 2018. Of the 16 states with women gubernatorial nominees in 2018, 4 have never had a woman governor: Idaho, Georgia, Maine, and South Dakota. In Iowa, where incumbent Kim Reynolds (R) – who was appointed last year – is on the ballot, no woman has ever been elected governor. Overall, women candidates have won nominations for statewide elected executive offices in record numbers this year, though record-breaking nominations are concentrated in select offices (governor, auditor, and insurance commissioner). More detail by specific office is available here. 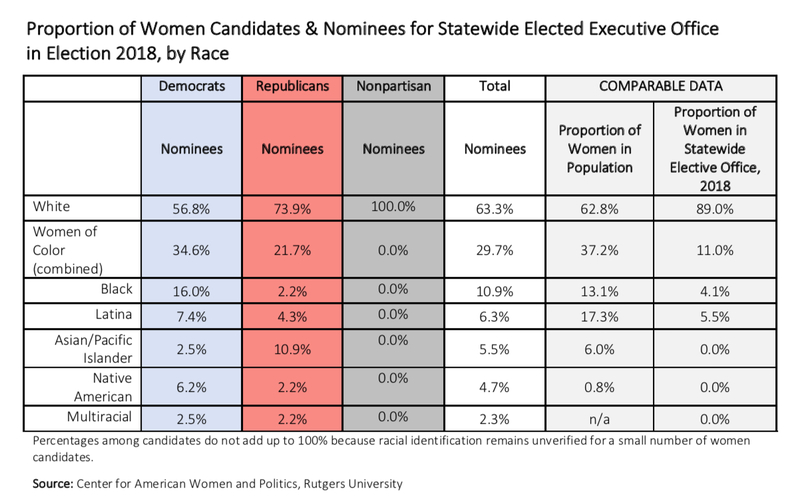 But women are still underrepresented as a proportion of all statewide executive nominees, with significant disparities by party. Women of color, who currently hold just 8 (2.6%) of statewide elected executive offices, are 10% of all nominees and 30% of women nominees for statewide elected executive office this year. If elected, Democratic nominee for attorney general Tish James would be the first woman of color elected to statewide office in New York. In Minnesota’s gubernatorial race, both male nominees have selected Native American women as running mates: Peggy Flanagan (DFL) and Donna Bergstrom (R). Either woman would be the first woman of color elected statewide in Minnesota and the first Native American woman lieutenant governor elected nationwide. Debra Call, Alaska's Democratic nominee for lieutenant governor, would – if elected – be the first woman of color elected to statewide office in Alaska and just the second Native American woman elected to statewide executive office in the U.S.
Women state legislative candidates have won nominations in record numbers this year. In 34 of 46 states holding state legislative elections this year, a record number of women have been nominated. However, these milestones vary by party. 35 states have hit a new high for Democratic women nominees for the state legislature. 10 states have hit a new high for Republican women nominees for the state legislature. 7 in 10 women state legislative nominees in 2018 are Democrats. 71% of women nominees for state senates are Democrats. 70% of women nominees for state houses are Democrats. Larger proportions of Democratic women than Republican women nominees across state legislative chambers are running as challengers to incumbents in November. Our full election information, as well as candidate lists and historical information, is available through our Election Watch page.